Our product range includes a wide range of semi anechoic chamber, wedge anechoic chamber and noise test booth. 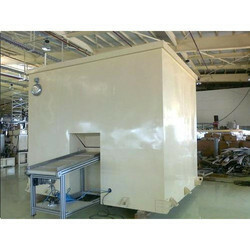 In order to retain remarkable position in this industry, we are providing a wide array of Semi Anechoic Chamber. 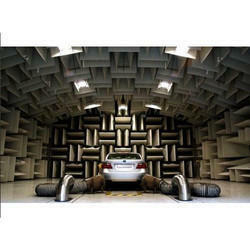 Semi-Anechoic Chambers are typically used for the measurement of Noise and Vibration of Vehicle during run-up, steering wheel testing, engine compartment testing, seat rail vibrations and measurement of exhaust and air intake. Being one of the trusted organizations in the market, we are indulged in providing a wide range of Wedge Anechoic Chamber. These have working floors constructed with grating floor sections to support heavy test specimens above the floor wedges. These are basically designed to suppress the internal sound reflections and used for acoustical measurements. 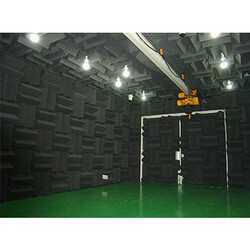 We are a unique name in the market to provide our respected customers an exclusive range of Noise Test Booth. The primary function of this booth / chamber is to control the ambient noise and increase the accuracy of intensity measurement by reducing sound reflections. Widely used in Automotive Sector, Refrigeration, Air Conditioner manufacturing units, Fan, Electrical Motor, Transformers, Compressor Manufacturing units, Speaker Testing etc to check specified noise level of equipment and to find out defects in products during production stage to avoid rejection. Manual/Automatic system of product entry/exit, without any noise leakage, the automatic system to open/close entry/ exit door can be synchronize with test bench to achieve test cycle. In-house expertise in acoustic design, civil, structural, mechanical and electrical engineering and every aspect of project management. Looking for NVH Test Chambers and Booths ?